11th Dec 1823 the foundation stone was laid for Richmond Bridge, a bridge that would span the Coal River in Richmond, Tasmania. Using convict labour it would take two years to build what would become Australia's oldest bridge. It was originally named Bigge's Bridge after the man who originally recognized the need for the bridge to aid in the transportation of convicts and military personnel between Hobart and Port Arthur. In 1829 there was a need to rebuild some of the piers in Richmond Bridge. George Grover a convict who had arrived in Van Diemens Land in 1825 had steadily climbed 'the convicts ranks' and was tasked as the head of a convict road gang. George loved the position and the power it gave him. Grover would mercilessly hand out his brand of punishment whipping and beating the convict labourers who did not work hard enough. One story states that he used to ride the heavy stone laden hand carts whipping the men who carried it as they transported the stone from the quarries. 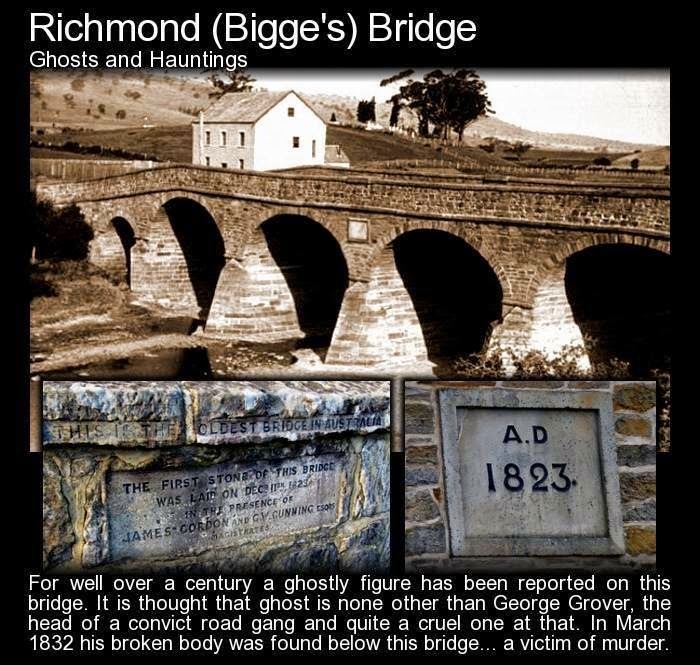 Understandably the convicts hated George Grover and early one morning in March 1832 George Grover's near dead body was found broken on the rocks under the Richmond Bridge. Before he died of the wounds he stated that he was resting on the bridge when four men picked him up and threw him over the parapet. Some reports say he was drunkenly passed out on the bridge when he was tossed over while other reports have him bashed on the head with a pickaxe. George Grover's ghost has been seen about the bridge on numerous occasions. He is seen as a dark silhouette with barely discernible clothing and no face. He can be seen watching the bridges traffic from the trees to the west of the bridge or more concerning stalking people. There is a dark feeling of anger and foreboding across the bridge as if George is projecting his outrage over his death. The sound of disembodied footsteps are also a common experience.